HCM CITY — A wide range of telecommunications and IT products and services will be on display at the 2018 Vietnam ICT COMM to be held in HCM City next month. It will feature more than 350 booths set up by 250 exhibitors from 20 countries and territories, 50 per cent higher than the number in the last two years. The products on display will include software, mobile applications, applications for enterprise, web solutions, hardware devices, wireless technologies, internet services, service management, electronic products and services, broadcasting equipment and services, network infrastructure, and others. Held by Adpex JSC, the Việt Nam Association for Information Processing, Việt Nam Internet Association, the National Agency for Technology Entrepreneurship and Commercialisation Development, and the Việt Nam Climate Innovation Centre, the exhibition’s main objective is to create opportunities for local and foreign ICT companies to show off their products and services, seek potential customers and attract investment. 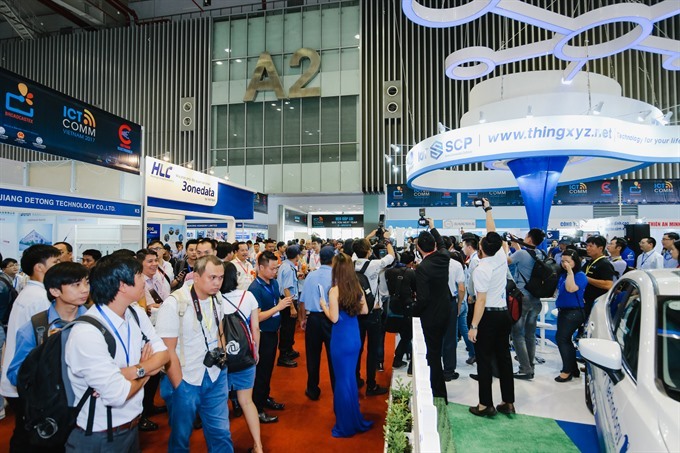 Known for its large size and rich and specialised contents, Vietnam ICT COMM is expected to help boost the country’s telecom, IT and communications industries, according to the organisers. It will also feature a number of seminars featuring leading local and international experts on topical issues such as application of IoT technology in cities, problems and solutions related to cyber security and penetrating the global technology market.